It's Monday - Let's be Honest: I am lonely. I wake up to little feet bounding down the stairs. As I make my way down to the kitchen, I am greeted by cheerful, but demanding voices. I'm hungry. I'm thirsty. Can we have mac n cheese to eat? I pour my coffee, rub my back and begin my day. It is the simple conversation that dominates my day. Mommy, did you know....Mommy, can I please have another yogurt drink....Mommy, can we go to the park.....Mommy? Mommy! They are either demanding or fighting. I crave silence so bad that I leave them in the house for a few minutes to sit in our garage. A hot, sticky, gas-smelling sauna. I'd rather have the gas-smell and peace, even if it is just for a minute. Sometimes at the end of the day, I realize that I have had NO adult conversation all day long. Maybe for five minutes on the phone with my husband, but other than that - all I talked about was superheroes, potty happenings, and why some caterpillars will not be butterflies but moths. I am in a season of loneliness. Six years ago I was beginning a new season of loneliness. My first baby was born and I became what I *thought* I had always wanted to be: A Stay At Home Mom! Spoiler for all you soon-to-be or want-to-be stay-at-home-moms: it can be lonely. It shocked me how lonely that time was. I'll never forget what my mom told me though: Enjoy this time, she said. Study God's Word. Take advantage of naptime and having free time. FREE TIME?! What?! With a newborn?! Little did I know how much free time I really did have. I felt so alone at the time. I thought the season would pass faster - just like that summer before college. Nope. I am still in a season of loneliness. I am still taking my mother's advice though: studying God's Word and taking advantage of naptime. In a recent article at the LMP Blog, Lindsee shared how God wanted her all to Himself. She was going through what would be considered as a time of loneliness. Yet, she saw it as a time where she could be alone with Jesus. But you would not. Israel bulked at the idea of returning to God. Have I been bulking this season of loneliness? Have I been trying to avoid being lonely because I thought it a negative feeling? We can embrace this season. It is a season that we can be alone with Jesus. We can pour our hearts out to Him. He can have all of our attention (at least during naptime and/or bedtime). He is enough. But you would not. Israel did not want God to be enough to defeat their enemies. They wanted chariots. They wanted armies. God wanted to be their strength and confidence. Do we see this season of loneliness as a season of emptiness? Do we see the strength that awaits us when we rest and return to God? For in YAH, the Lord, is everlasting strength. 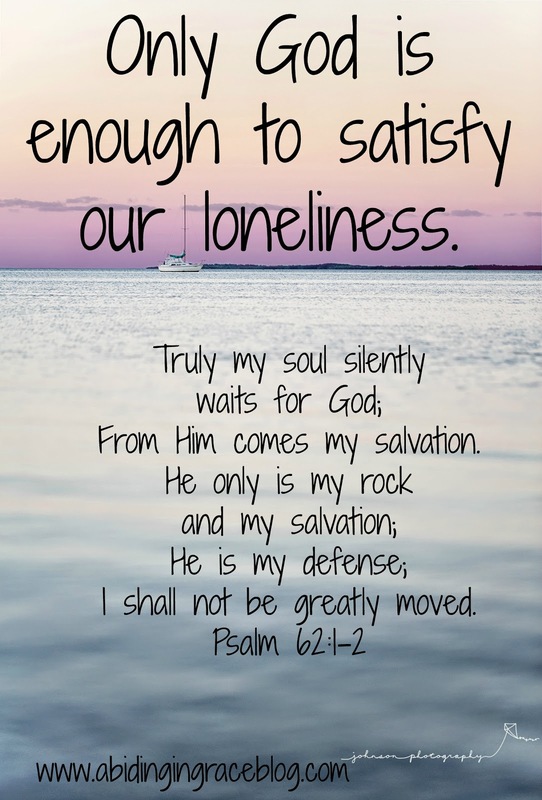 This season of loneliness is simply a season of aloneness - Time alone with God. Instead of struggling with feelings of loneliness, we can use these times of aloneness. We have no distractions. God has us all to Himself. We have only Him to rely on. That season of loneliness I had the summer before college was one of extreme spiritual growth. I grew closer to God than ever before. This season can be that too. Over and over again, during different seasons of loneliness, or aloneness, we must ask ourselves: IS GOD ENOUGH? Embrace this season. Embrace feelings of loneliness and run to God. We may not have all the answers. We may still need to have a lunch date with a friend. We still need to go to church and meet with other women. We may still feel lonely. He may not give us people to cure our loneliness, but He will give us Himself. I shall not be greatly moved. Make sure to check her out today too! Please contact me if you would like to share your "Honest Moments" or if you are also in a season of loneliness.